Colombian agrarian, indigenous, and Afro-descendant groups convened at a National Agrarian Summit on Saturday, March 15 to vent their anger with the administration of President Juan Manuel Santos (2010-2014). Moving into protest marches the following Monday, attendees united to express frustration over the government’s inaction regarding promises that were agreed upon last September. The accord had ended a nearly three week national agrarian strike, but since then Santos has been backpedaling. Politics complicate the situation. The successes of former president Alvaro Uribe’s ultra-right Democratic Center (CD) party during the March 9 congressional elections now poses additional obstacles for the nation’s government, particularly regarding its attempts to fulfill its obligations to the agrarian sector, for the CD stands in determined opposition to reform. The CD is also challenging the current status of the peace negotiations now being held in Havana, Cuba, particularly the transitional justice plan for the integration of FARC members into the country’s civil and political life. Meanwhile, Colombia will hold presidential elections in May, with former Bogotá mayor and member of the center-left Green Alliance party, Enrique Peñalosa, and President Santos as the front-runners. Whoever is elected will face the twin challenges of seeking to finish the peace negotiation successfully, while also delivering on the promises made to poor farmers. More than 4,000 leaders from an array of social organizations came together on Saturday, March 17, at the Agrarian Summit (“Cumbre Agraria Campesina, Étnica y Popular”) to address the pressing issues of land distribution and recognition, land displacement, food sovereignty, mining, and free trade agreements. The meeting was an attempt to unify indigenous, Afro-descendant, farmer, and worker communities to push for a structural change in Colombia’s agrarian policy. Eleven organizations, including the National Agrarian Coalition (CNA), the Black Community Movement (PCN), the Congress of the People, the Patriot March, the Roundtable of Dialogue and Agreement (MIA), and the National Indigenous Organization of Colombia attended the Summit. These organizations are reviving the mobilizations of 2013, which included a national agrarian strike that took place to demand popular participation in the peace negotiations, investment in social programs in rural areas, control over seeds, the fulfillment of a series of promises, and protection from free trade agreements. The FTA with the U.S., signed in May of 2012, is of particular concern for farmers. If the government does not address the grievances of the campesinos, another National Strike is almost certain to take place at the end of April/beginning of May. The timing for these protests is important, as they will occur just prior to the country’s May 25 presidential elections. The organizations and their leaders who convened at the National Agrarian Summit and participated in the protests on March 17 released a declaration which outlined specific demands and grievances that need to be addressed by early May. The Santos administration faces a threat from the newly formed Democratic Center (CD), which is now the second strongest force in the senate. The CD, led by former President Uribe, will challenge the majority of Santos’ National Unity Coalition, which consists of Santos’ U party, and the Conservative, Liberal, and Radical Change, parties. The immediate impact of the CD’s congressional success was a major decline in representation for the U Party: a loss of 10 seats in the 166-member House of Representatives and 9 seats in the 102-member Senate. The CD now holds 19 seats in the Senate and 12 in the House. Uribe’s party even grabbed a victory in Santos’ home district of Bogotá. 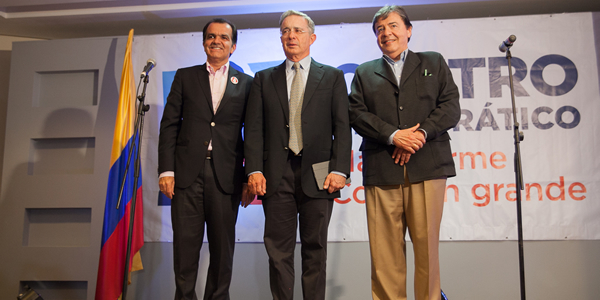 The Conservative Party (PC), a major force within the National Unity Coalition, had previously backed Uribe. Now the PC is beginning to break with the Santos’s coalition, instead endorsing its own candidate, Marta Lucía Ramírez, in the upcoming presidential elections. 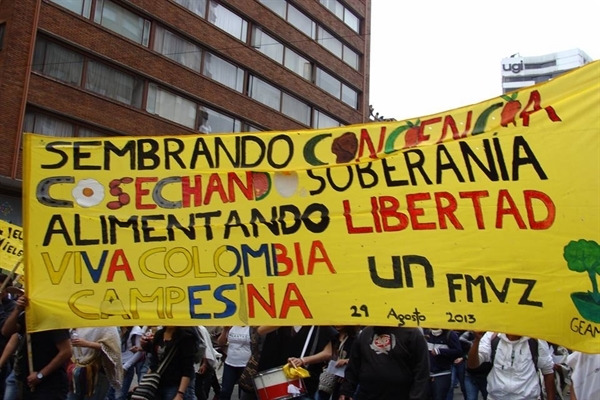 These evolving political alliances and electoral inroads by Uribistas present challenges for the ruling government’s approach towards the ongoing peace process currently taking place between the revolutionary armed forces of Colombia (FARC) and the Colombian government. Thus far in the talks the FARC have promised to end its use of violence if granted full political participation by the Colombian government. The FARC shares the demands of the agrarian movement, calling for economic development of rural lands and for land redistribution. 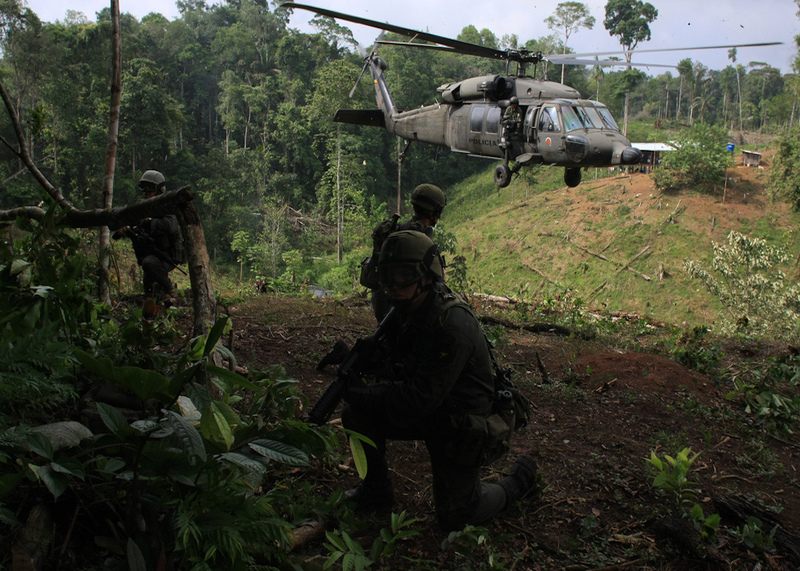 The FARC has also proposed reform of the drug regulations in hopes of continuing their cultivation of coca and other presently illicit crops. 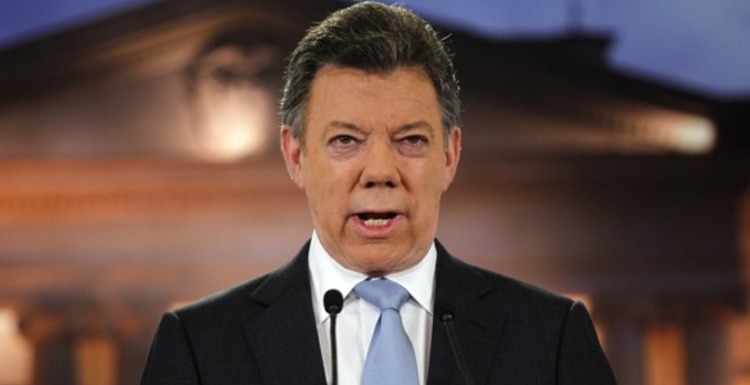 The FARC recently expressed their own concerns with the head of state. After Santos defied a recommendation of the International Commission of Human Rights by ousting Bogotá mayor, Gustavo Petro, and replacing him with Rafael Pardo, the FARC stated at the 22nd round of negotiations in Havana that, “This fact creates a negative impact and affects the confidence at the negotiation table.”  Petro had been a strong advocate for finding a pathway to peace in Colombia, a determined voice for reconciliation. Uribe joins Zuluaga and other CD members in their fierce determination to derail the peace talks. Uribe personally led a “democratic security” campaign against terrorism throughout his presidency and has openly opposed Santos’ policy of transitional justice and political inclusion of the FARC. 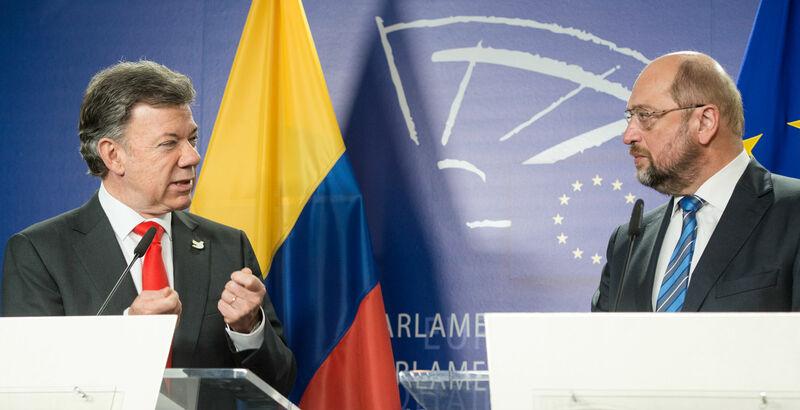 Uribe still strongly favors the U.S.-backed military solution to dealing with the FARC militarily, and perceives Santos’ approach to conflict resolution as weakness. Uribe rejects all consideration of FARC amnesty and political inclusion. Whether it is Peñalosa or Santos who wins the presidency this May, the next administration needs to take a clear path in regards to agrarian reform and the peace talks. The future administration will have to work with a wide-range of agrarian representatives and leaders to establish a comprehensive and fair agreement. Then, the government must fulfill its obligations explicitly agreed upon within that agrarian accord. While the establishment of the CD party in congress is disturbing, the next administration can overcome its presence by rallying those in support of the peace process in Colombia. A final agreement established via the Havana peace talks will serve as a vital framework for peace. However, further steps need to be taken in order to guarantee the stability of a peaceful and equal society in Colombia.